The quickest Thanksgiving edible craft treat. 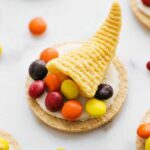 These miniature cornucopia cookies only require 3 ingredients and minutes to make! 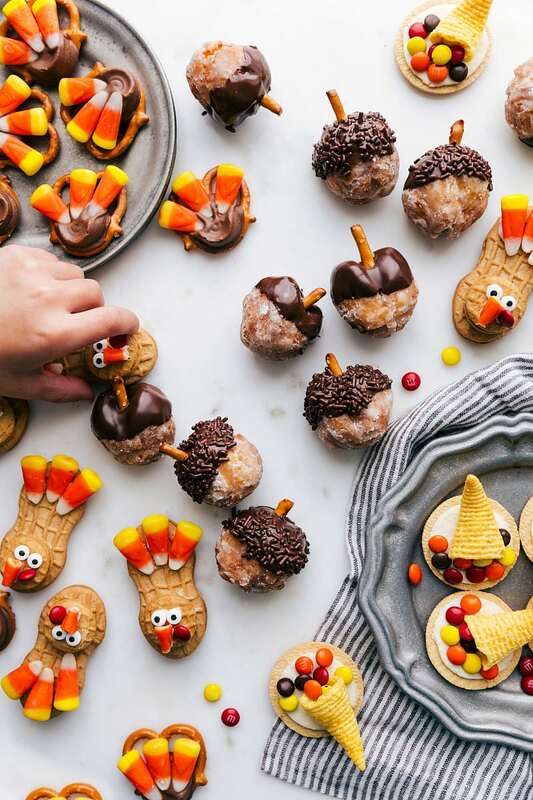 Some Thanksgiving treats are pretty much the cutest thing you’ve ever seen, but then making them is a whole different story. Like you need to be a professional pastry chef/decorator to make them look even a little bit good, right? These, however, require no special skills. They are so ridiculously easy! So easy that my two year old even made a few that are in these pictures!! Of course, not too many made it in the photo shoot because he was pretty busy eating all the bugles, cookies, and M&M’s as quickly as he could. His favorite of the three ingredients are actually the bugles, he could eat those all day long!! And me? I’ll take ALL the M&M’s please. 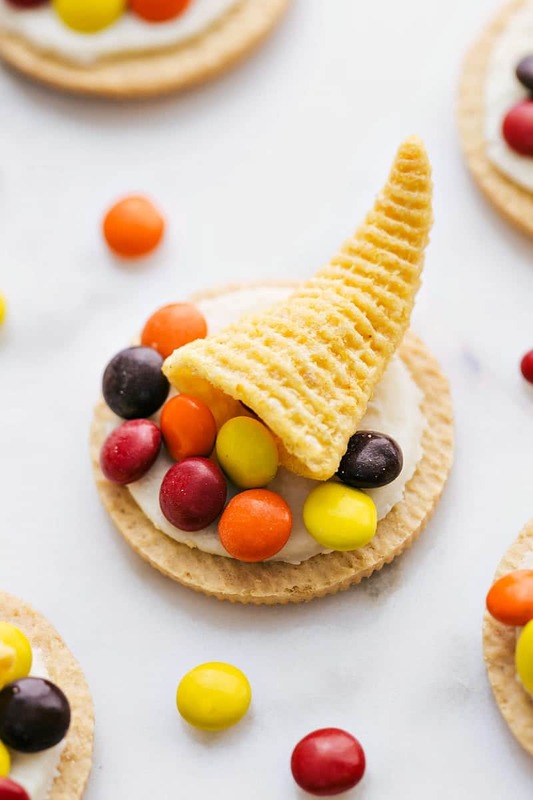 To make this very easy treat, simply attach a bugle to half of a cookie and add some M&M’s. 🙂 So just 3 ingredients to make these! I guess technically you could add a fourth ingredient if you want these cookies to be super stable — a tub of frosting (or homemade frosting would be a few more ingredients) to pipe on some of the M&M’s to keep them right where you want them. I just pressed the M&M’s into the creme filling in the oreo and they stuck fine. I also scraped off a little frosting from cookies that didn’t come apart pretty to use those and make the M&M’s stay in place. I hope you enjoy these as much as my two year old:) Happy Thanksgiving everyone! Separate the golden oreo sandwich cookies and eat or save the side of the cookie with no frosting. I found the best way to separate the oreos is by twisting the top off from the bottom. On the side with the frosting press a cornucopia-looking bugle onto the cookie. Press the mini M&M's strategically in and around the bugle. Use extra frosting from cookies that didn't separate well if needed to get the M&M's firmly placed on the cookies. These are adorable, Chelsea! I absolutely love your creativity. I agree, some cookies look cute but are hard to assemble, but these are just perfect! These cookies look so cute and very easy to make! Pinning! Super cute AND easy, love it!! These are so cute! I’m all for cute things that aren’t too hard to make – especially since I have such unsteady hands!